In recent blog posts I have listened to kawaii metal via Babymetal and cello metal via Apocalyptica. I figured for a third go I would listen to some goth metal, which is basically a sort of dark, dramatic kind of rock music. It seems to use a lot of the standard techniques and sounds of metal, but in much softer ways. In my experience it sort of sits on the fringes of metal as a broad genre, incorporating little bits of electronica and classical music to round out its sound. A band whose work I have really enjoyed in this sub-genre is the Italian group Lacuna Coil. They have been around since 1994. Two years ago they released Broken Crown Halo, their seventh studio album. It is not their best work in my opinion - that would probably be their 2006 album Karmacode - but it is still pretty representative of their sound and a pretty enjoyable example of goth metal. "Nothing Stands In Our Way" is a very solid opening track. If this is your first time listening to the band, it is a pretty strong example of their general sound: dual vocalists, a strong beat, layered guitars, and a nice balance between rough and smooth elements. The energy ramps up in "Zombies", which employs a really good contrast between Andrea Ferro's rougher vocals in the verses and Cristina Scabbia's more sweeping tone in the chorus. It's a particularly strong song, and the album's first highlight. "Hostage to the Light" is an excellent track as well. It's slower, and takes a little time to build, but once it gets going it is a nicely heavy anthem. The middle section of the album becomes fairly generic and broadly similar, as the middle of albums have a tendency to do. To the band's credit there is an attempt to find new material and fresh angles on each track. "Die and Rise", for example, is pushed along by some great guitar riffs. "I Burn in You" features some beautiful vocal work by Scabbia. "Cybersleep" has a fairly nice epic sensibility, and thanks to a Monty Norman-esque base line sounds an awful lot like a James Bond theme, but it never quite manages to excel where it should. The album's back end gets a lot more energised and exciting, with "In the End I Feel Alive" picking things up from the get-go. It is immediately followed by the final song "One Cold Day", written and dedicated for former band mate Claudio Leo, who died in 2013. It has an epic, broadly orchestral opening and is followed up with a slow, nearly mournful tone. Cristina Scabbia's singing is top-notch, and it brings the album to an emotional close. In all honesty there is a sense that Lacuna Coil peaked back around their third and fourth albums, and while they continue to present well-produced and enjoyable albums they somehow lack the spark that used to make them a genuine treat to listen to. 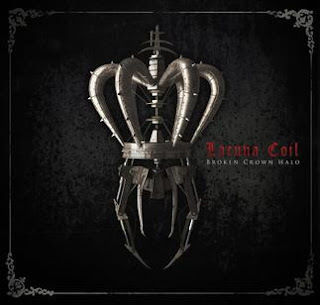 Broken Crown Halo is a good album, and certainly a big step up from other recent work, but it does feel just a little as if the band needs a solid creative shake-up to surprise their fans in the future.